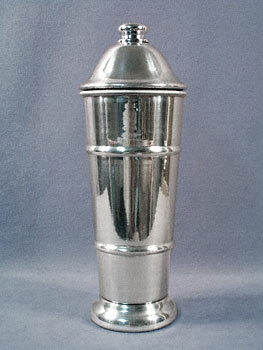 This is a Coldseal Cocktail Shaker made by Kraftware in the 1940s. It stands 12-1/2" tall, has a 3-7/8" diameter at the bottom, and gradually increases to 4-1/4" at the point where the top fits in. This shaker holds a quart, and is built with a double wall for thermal insulation. The finial screws off the lid for accurate pouring, and the body is accented by horizontal ribbed rings. This shaker has been polished, is in exceptional condition, and has the Kraftware name and trademark on the bottom. This is a very clean shaker with a great design.